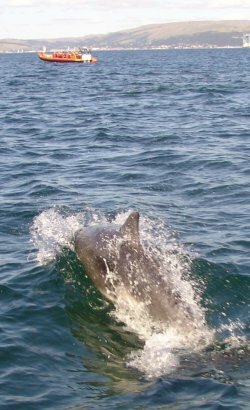 We have a variety of different Wildlife and Adventure trips where you can enjoy the fantastic scenery and wildlife that surrounds our area from Largs. 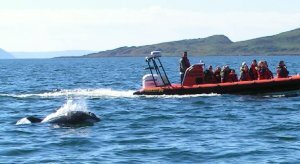 Its more than just a boat trip from Largs, at CUMBRAE VOYAGES we offer unforgettable marine adventures and wildlife trips amongst the beautiful islands of the lower Clyde. 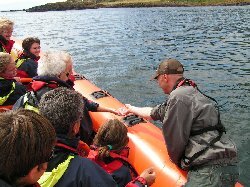 Join us for a fully interactive expedition onboard our custom built, 12 seat, Rigid Inflatable boats. 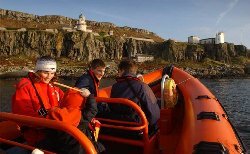 Voyage around the Cumbraes, view the spectacular scenery, wonder at the variety and beauty of the wildlife which surrounds these Islands. Each trip provides a mixture of exhilaration and sensitive appreciation of the fantastic wildlife. These informative boat trips last approximately 1 hour. Venture to the Sound of Bute, offering magnificent views across to the Isle of Arran, The Mull of Kintyre & up the dramatic Loch Fyne. This area is often home to Basking Sharks, Dolphins and Whales. 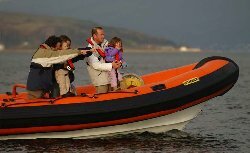 These boat trips from Largs are longer than the others and they cover a great deal of ground and will give you a boat trip to remember as they incorporate so much of the area around Largs, the Cumbrae Isles and the Isle of Bute. The trips last approximately 21/2 to 3 hours. The speed and manoeuvrability of our boats allow us to take you to areas seldom visited, providing you with close encounters of the Islands wildlife safely and enjoyably.